We now offer the Large Duplex Dog House with a single door. The Single Door Large Duplex Dog House is a smaller version of our Single Door Goliath Dog House, and has all the same great options available. The perfect house for a couple (or more) smaller to mid size dogs that “get along”. House pictured includes optional SealSafe™ door, windows, raised foundation, porch & deck. 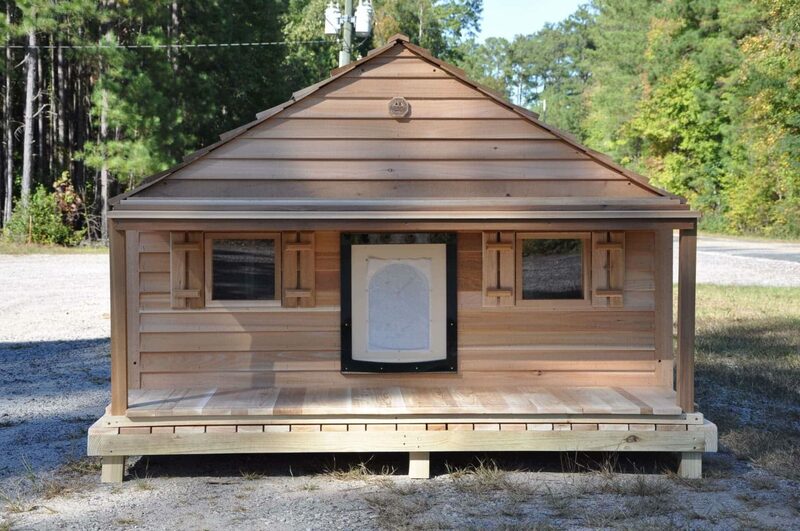 Blythe Wood Works is now offering the Large Duplex Dog House with a single door. This dog house is a smaller version of our Goliath Single Door Dog House, and has all the same great options available. The compartment is 72″ wide and 38″ deep and with a single center door, and has a gracious wind free sleeping area on each side. The perfect house for a couple (or more) smaller to mid size dogs that “get along”. Finally, this house is designed so that the rain will fall to the side of the house, not at the door, where your dog will track in mud and water!